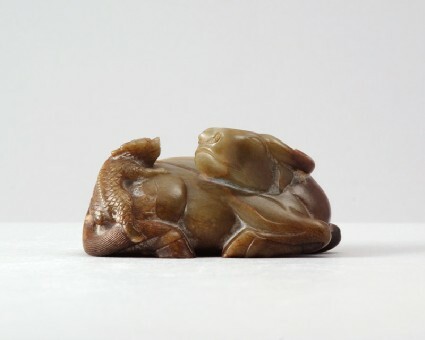 Made of yellowish-green jade with brown patches, the piece is carved in form of a reclining water buffalo with a small horned, scaly feline clambering up its back. The broad bovine head is secured with a rope through the nostrils which forms a loose loop on its back. Between the curved horns is has a hump where the skin forms folds. The hooves are clearly rendered on the underside.